The rapid development of aviation during the First World War was mainly aimed at improving the principal characteristics of aircraft speed, maneuverability, and range. Structurally, airplanes of that period remained descendants of the Wright brothers very first flying machine-they were still produced from the traditional materials of wood and canvas; structural strength was attained with the help of numerous bracing wires. But there were certain particular warplanes, some of which barely had time to take part in combat, essentially differed from all the rest-the Junkers J I, Junkers CL I and Junkers D I. These airplanes were of a completely new type. They were a great advance for their time-their design consisted entirely of metal. Their design fundamentals were simple-a framework of thin duraluminum tubes was covered with sheets of corrugated aluminium. The ingenious German designer and inventor Hugo Junkers patented this idea in 1912. It became the basis of his theoretical development "of a thick cantilevered wing". After the beginning of the First World War Junkers convinced Idflieg of the potential of his development. The Junkers J I, a heavily armored ground attack plane, made its first flight in the winter of 1916. This airplane has become famous, because none of the Allies could bring down any of these machines during the war. Junkers D.I, s/n unknown, Belgium, late 1918. 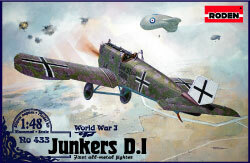 Junkers D.I,c/í 5185/18, Western Front, Autumn 1918.